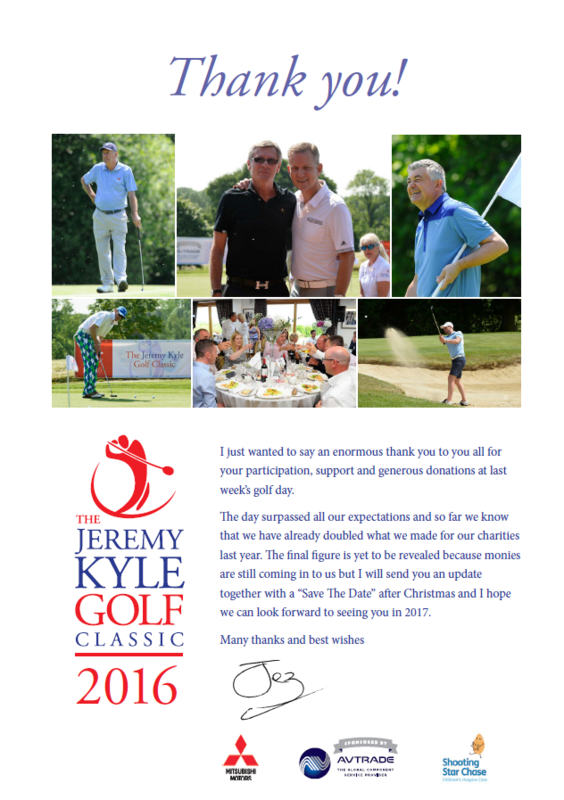 Avtrade was delighted to be the main sponsor of Jeremy Kyles 6th Annual Classic Charity Golf Day held on 6th June 2016 at the Windlesham Golf Club in Bagshot, Surrey, one of the finest courses in the South East. This year’s event was in aid of the charity Shooting Star Chase, a leading children’s hospice caring for babies, children, young people up to the age of 21 with life-limiting conditions, and their families. The care and support provided is for the whole family, offering a bespoke service to suit each member’s individual needs. On a beautiful sunny day, participants were greeted by their host Jeremy Kyle and presented with a range of Jeremy Kyle and Avtrade golf gifts. 20 teams of golfers were partnered with either a showbiz or sporting personality, with notable attendees such as comedian/entertainers Russ Abbot and Bobby Davro, England cricketer Kevin Pietersen, snooker legends John Parrott and Steve Davies, former England rugby star Mike Tindall and champion jockey AP McCoy to name but a few. Competition was high with a number of trophies up for grabs but played in good spirit and humour with many golfers taking the time to meet the children and staff who attended from the Shooting Star Chase charity. As in previous years, the golf day proved to be, not only a first class golfing experience for all involved, but an impressive fund raiser for the chosen charity. With spouses and partners joining the evening dinner, entertainment from the effervescent Bobby Davro and the auction of a spectacular range of items including highly desired sporting memorabilia, this year’s event raised a staggering £115,000 for the charity Shooting Star Chase. Avtrade would like to thank the organisers for putting on such a fantastic day and evening, and continuing its commitment to support charitable causes, Avtrade was pleased to be able to contribute to such a worthwhile event.